OK, the category is jazz groups with guitarists who venture outside of the clean tones traditionally favored in the genre, who push the limits of their instrument beyond typical jazz politeness. We’ve covered a lot of these, including Raoul Björkenheim, Ádám Mészáros (Jü), Joe Morris (The Spanish Donkey), Manuel Troller (Schnellertollermeier) — players who tend to the noisy side of the spectrum, and often record for RareNoise or Cuneiform. Christian Achim Kühn falls into this category, with playing that can venture off into dissonance and distortion only to suddenly change gears with a lovely classically-inspired phrase or two. His band Kuhn Fu has several other things going for it as well. Bassist Esat Ekincioglu plays an upright instrument rather than a bass guitar, and his sound combines in interesting ways with the guitar, very different from what an electric instrument would do. It’s reminiscent of Björkenheim’s band Ecstasy, though the context is different due to the next factor: Ziv Taubenfeld’s bass clarinet. It’s hard enough to come up with examples of groups featuring bass clarinet as the main woodwind rather than a source of coloration in support of a saxophone or flute, but to put it in conjunction with an adventurous electric guitar is unique in my experience. Lav Kovac’s drums provide the rhythmic base, straddling jazz, rock, and free styles to both propel and elaborate on the compositions. These tracks cover a wide sonic range, from thrashing rock-oriented pieces to sparsely arranged moods to bouncy, slightly funky jams. Taubenfeld is not limited by his instrument’s typical role, instead treating it with all of the variety you might expect from a tenor sax, at times screeching or tossing off furious flurries of notes, at other times accenting the bass part. Kuhnspiracy is tons of fun, both in the compositions and the improvisations, and this is definitely a band with a sound all their own and the talent to make it work. 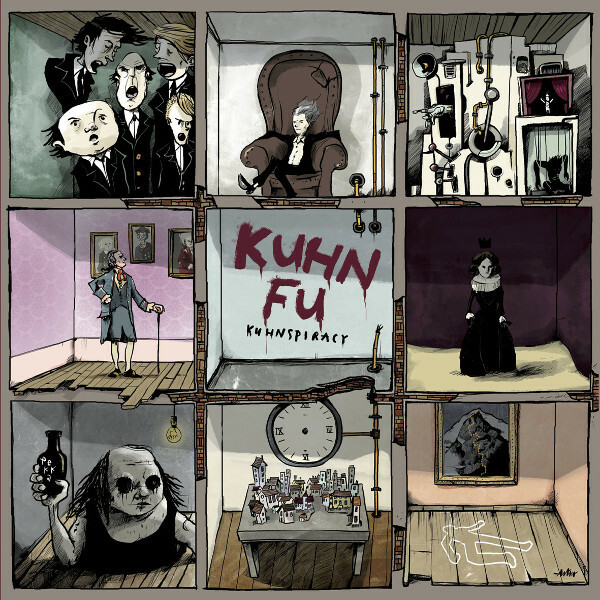 Kuhn Fu is the brainchild of German guitarist / composer Christian Achim Kühn and an international band based in Groningen, Netherlands. In addition to Christian, the other members are Ziv Taubenfeld (bass clarinet) from Israel, Esat Ekincioglu (standup bass) from Turkey, and Lav Kovac (drums) from Serbia. They have been around since 2012, releasing their first album in 2015. They’ve been touring extensively through the Netherlands, Belgium, Germany, Czech Republic, Switzerland, Austria, Turkey, and Israel, playing over 100 concerts, honing their sound and compositions. All eight instrumental tracks on their second album Kuhnspiracy were written by Christian and they could only achieve their present tight playing through live performances. When they entered the studio the result was that there was no overdubbing and a minimal amount of editing, essentially live in the studio performances. Their focus is not on improvisation, but on telling a story as an ensemble with dynamic extremes. Kuhn Fu is a band that defies description. They style their music as post-romantic jazz / rock disorder. I suppose that is as good a label as any. To my ears, they have extended the Rock In Opposition genre with their classical leanings and deranged playing. The only band that comes close in my mind to Kuhn Fu is Finnish band Alamaailman Vasarat. I applaud Kuhn Fu’s unusual use of the bass clarinet and its four octave range. I would never have pictured it in a rock setting, as the bass clarinet normally provides orchestral accompaniment. The dark jazzy nature of their music is enhanced by Ziv and Christian trading lead lines and playing duets across the disc. When I saw that the second tack’s title was “Barry Lyndon,” I did not know what to expect. Kuhn Fu’s composition does not evoke images of Stanley Kubrick’s movie. But I think the chord changes are based on Handel’s "Sarabande." I find it challenging to single out specific high points — you have to take the album in its entirety. There are moments of romantic beauty that alternate with controlled harsh pandemonium. I could be wrong, but it appears that each of the eight tracks corresponds to one the nine rooms in the cover art. Quite an impressive release that is sure to appeal to anyone tired of the same old, same old. Edward Ka-Spel & Philippe Petit - "Needles IV"